Bat puppets are folded and cut in bat shape. White reinforcements are used for eyes and a mouth with fangs is drawn on. To make it into a puppet, staple a scrap strip of paper to the back on each side of the fold. Don’t staple this piece flat; leave a bit of play in it so the child’s hand can fit inside. Halloween is an appropriate time to introduce the _at word family (bat, cat, fat). 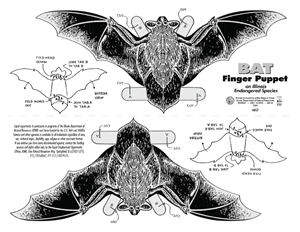 Bat erasers, purchased from Oriental Trading, are available in several colors and can be used for math sorting, patterning and graphing activities. Bags of Halloween candy often feature bats.